It was long flight to Cologne from Dulles airport. My wife says she didn’t sleep. I slept and read. We landed on time – 8:15 am (2:15 am our time) . It was a 7 ½ hour flight. We got our bags quickly. The airport seemed almost deserted. We knew that we should walk to the bottom level of the airport to find the trains. We were a bit lost until a nice ticket agent, and a kind person helped us buy our train ticket for Köln Hauptbahnhof (Cologne train station). We waited on a platform with very few people . It cost us 2.30 € each. It is a lot cheaper than a taxi, and an “authentic” experience. As we came into town, my wife was glued to the window, trying to see the cathedral as we crossed the famous train station bridge. When we arrived, we saw our hotel immediately as it was directly across from the train station. T here was a lot of construction in front of it because Cologne is building some underground transportation systems. It was a short walk to our hotel - The Four Points by Sheraton. 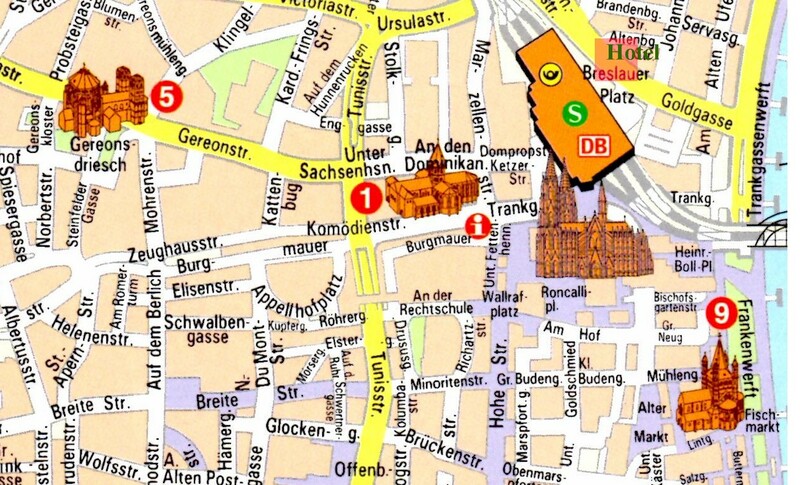 We were on the 7th floor on the front with a view of the Dom (Cathedral) and the train station. There was a small balcony and a sitting area in the room. The air conditioning worked well. We changed clothes and did a little walking. 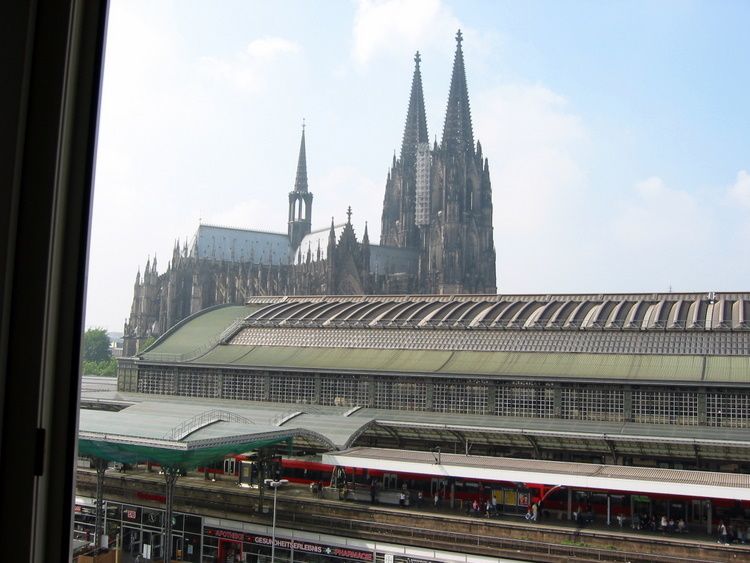 To get to the cathedral or any other place we wanted to visit in Cologne, we had to walk through the train station. There were a lot of stores and restaurants in the train station. Outside of the door of the train station on the left was the Cathedral (the train station is marked "S" on the map below. Our hotel was directly behind). As usual a lot of young people were sitting on the north side steps. It is a huge cathedral. We went in just as the Angelus/noonday prayers were being said, led by a nun. They had wonderful organ music. It was good to be there. 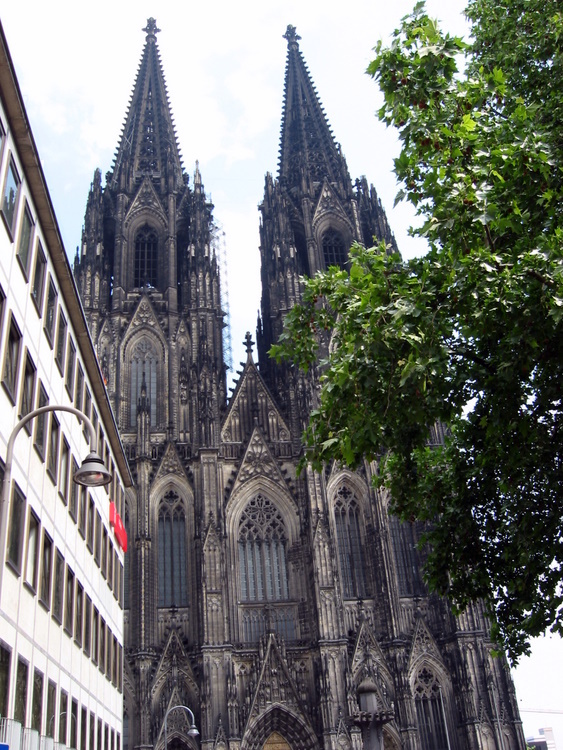 The Cologne Cathedral has a very long and interesting history. In the year 500 AD an octagonal baptistery was built over an older simple water basin. A few years later the building of a larger church began. By the end of the 8th century a choir was added to this building. Unfortunately this church was so badly damaged by fire that a new building was started. This church, known as the Old Cathedral, was started in 818 and finally consecrated on September 27, 870. The Old Cathedral was one of the largest churches in Europe. 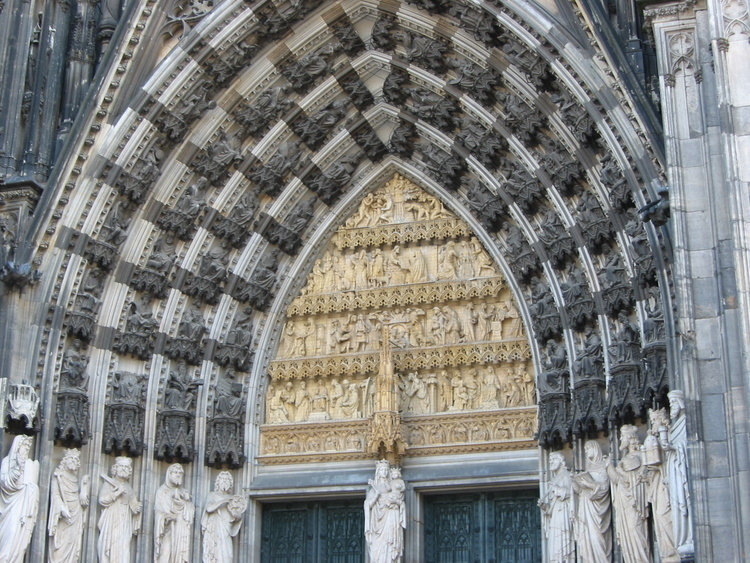 In 1164 Archbishop Rainald von Dassel brought the relics of the three Wise Men to the Cologne Cathedral making it one of the foremost pilgrimage churches in Europe. 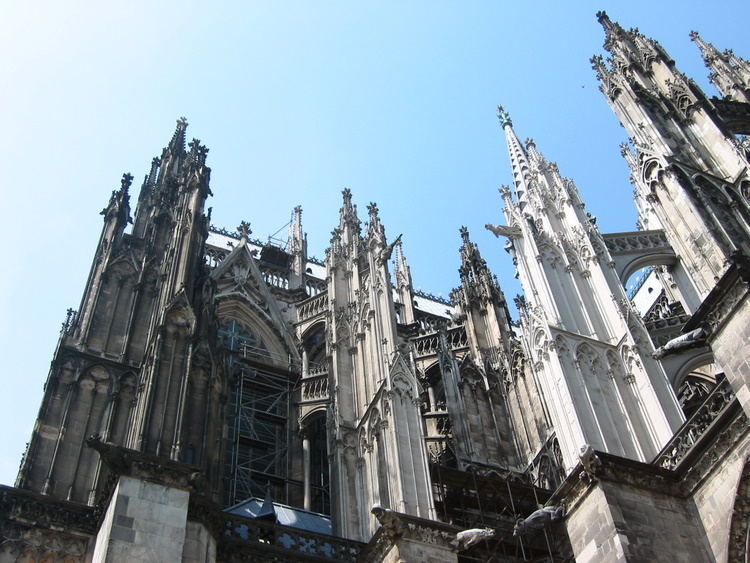 In reading the history of all the cathedrals, fire and war destroyed a great many of the original structures, so like so many other cathedrals , Cologne had a second fire on April 30, 1248. Only four months later, April 15, 1248 the foundation stone of a Gothic cathedral was laid. 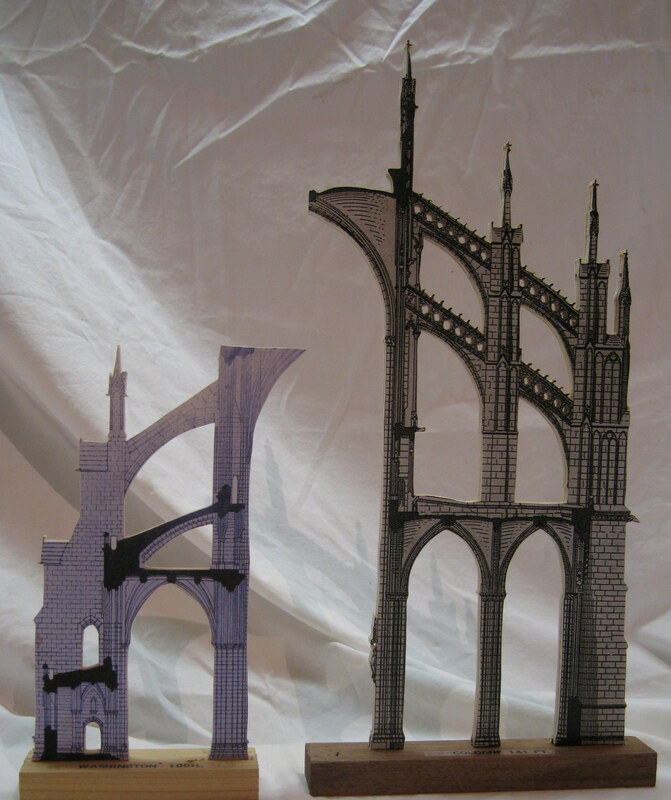 The basic shape was copied from the new cathedrals of France. This building was begun at the eastern end – the apse end – and within 70 years the new chancel/sanctuary for completed and furnished. The part of the cathedral that had not been destroyed by the fire of 1248 had been separated by a provisional wall. Now that the choir area was completed, what remained of the Old Cathedral demolished. The diagram on the left is of the present cathedral floorplan. There is a wonderful medieval mystery written by Frank Schatzing entitled Death and the Devil. It is a novel about the murder of the Cologne cathedral architect, Gerhard Morart in 1260. It is a fact that he either fell or was pushed from the cathedral’s scaffolding. The author’s conclusion is that he was pushed. Others who worked on the cathedral met the same fate. This book also gives a picture of the political climate in the church and state in the 13th century. It also is a thrilling mystery. In spite of the death of the architect, plans for the cathedral proceeded as Morart had drawn them. By the 14th century the southern aisles and the first story of the south tower were built. In the 15th century the second story was completed and the bells installed and the north side started. Early in the 16th century all of the nave and the side aisles were cover with a temporary roof which would remain for centuries. 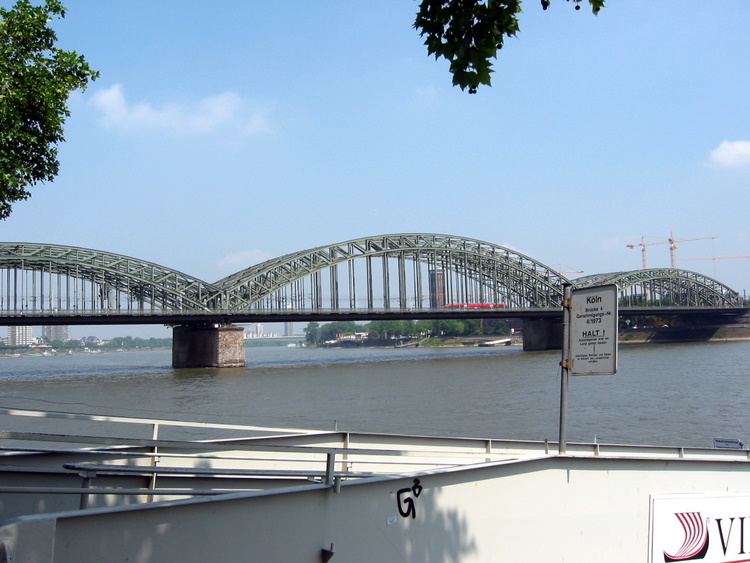 In 1794 the troops of the French revolution marched into Cologne. The archbishop and the cathedral chapter fled. For many years the cathedral served profane purposes. For a time it was used as a store for food for domestic animals. Only in 1801 it was consecrated again as a church. Building of the cathedral resumed again in 1842, 594 years after the cathedral’s foundation stone was laid. The cost of this is new work was divided between the Prussian King Frederick William IV and Friends of the Cathedral Association found by the citizenry. The Cathedral suffered in14 hits WWII but did not collapse. Reconstruction was completed in 1956. Height of central nave – 141 ft (Beauvais, the tallest cathedral is 157 ft.
Second tallest Gothic structure in world - steeple of Ulm Munster is higher. Cologne Cathedral exterior suffers from years of exposure to the elements and is very dark and dirty. There are several areas around the exterior where the cleaning of the stone has begun. Almost all of the French cathedrals have been cleaned in the past several years. The cleaning of the façade of Milan Cathedral was finished a little over a year ago. The portal over the front door was is called St. Mary’s Gate. There were over 700 statues mostly of Biblical figures by Peter Fuchs. It was very difficult to take a photo of the entire façade. The street that ended at the front of the cathedral was rather narrow so when I got back far enough on the street to capture the full height, the full width was not visible. I did take a “stitch picture”, but it looks a little distorted. The north side consisted of steps leading to a plaza in front of the train station. The south side opened into a large plaza near the concert hall. Upon entering the Cathedral one is almost overwhelmed at the height. 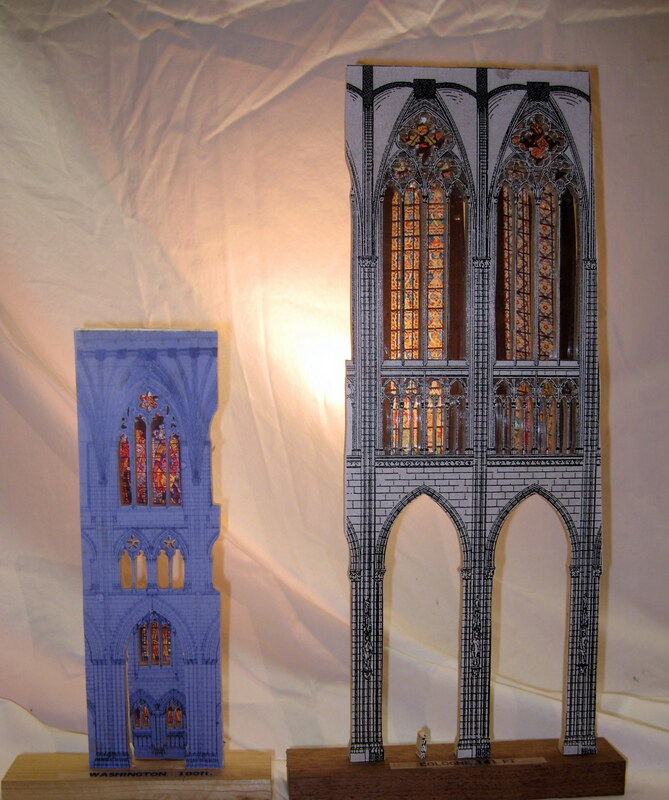 It is over 40 feet higher than the Washington Cathedral and only 14 feet lower than Beauvais. 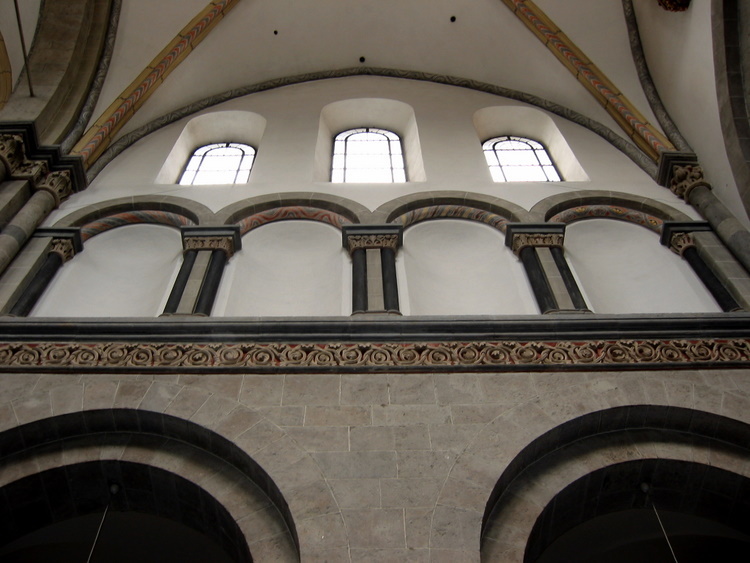 The windows of the clerestory in the apse were extremely tall. 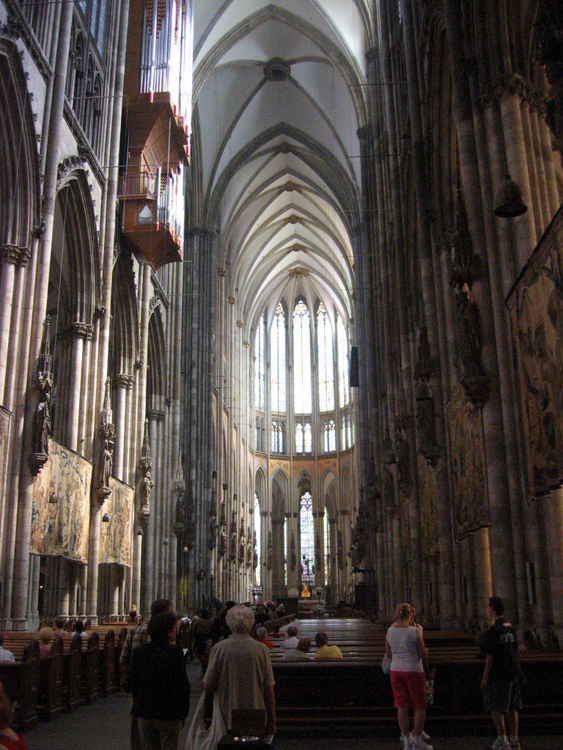 The columns and pointed arches of the nave were likewise very high. Between some of the columns were large tapestries depicting scenes from the Bible. On the area next to the top of the column arches were mosaic figures on a gold mosaic background. Each column had a statue on the nave side. The pipes of the organ were hung high on the triforium level in the middle of the nave. Behind the main altar was large gold reliquary. It is the shrine of the Magi (the Three Wise Men). In 1164 Hohenstaufen Emperor Frederick Barbarossa presented the Archbishop of Cologne, Reinhald von Dassel, with the bones of the Three Wise Men. 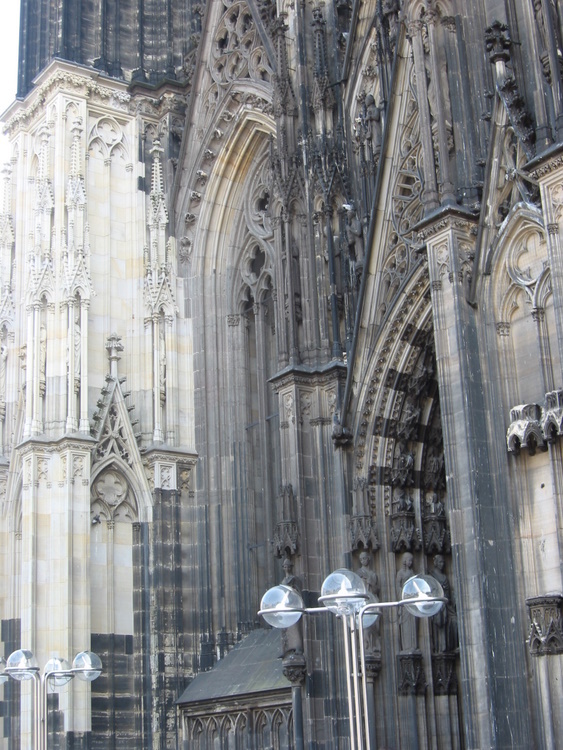 They had been removed from the Milan Cathedral and brought to Cologne. Thousand made and still make their pilgrimage to visit these relics. 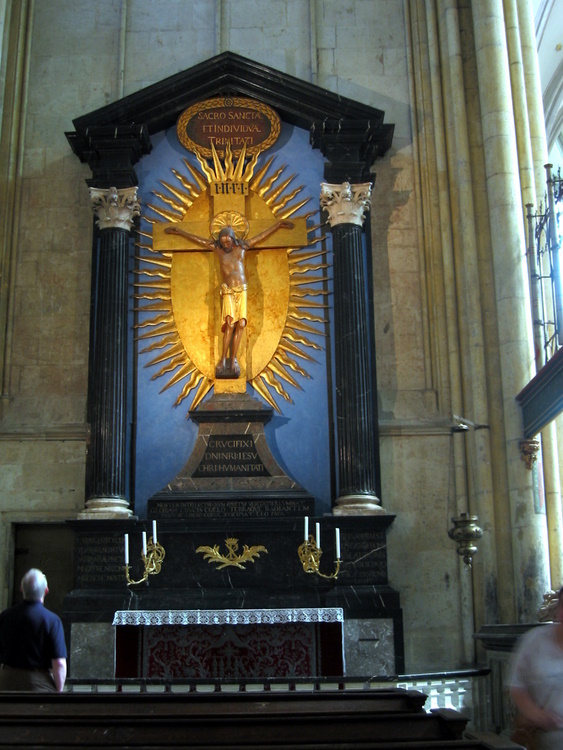 Between 1190 and 1220 Nichols of Verdun created a gold shrine for the relics. It is made of gold with 1000 precious stones and pearls and over 300 ancient gems and cameos decorate it. The Old Testament kings and prophets are seated on the bottom section and above them are the apostles with the crucifixion of Jesus at the back. The front is remove each Epiphany Day (January 6th) and the three skulls with gold crowns can be view through a screen. Another beautiful adornment is the Gero Cross. Archbishop Gero (969-976) donated this 6 ½ foot tall oak cross. Crosses of this size were unknown in Europe at that time. As we will be in Cologne for several more days, we will be able to explore more and more of the cathedral as we pass by it to our hotel. We walked down by the river where we found Restaurant Row facing the river and had a sandwich. 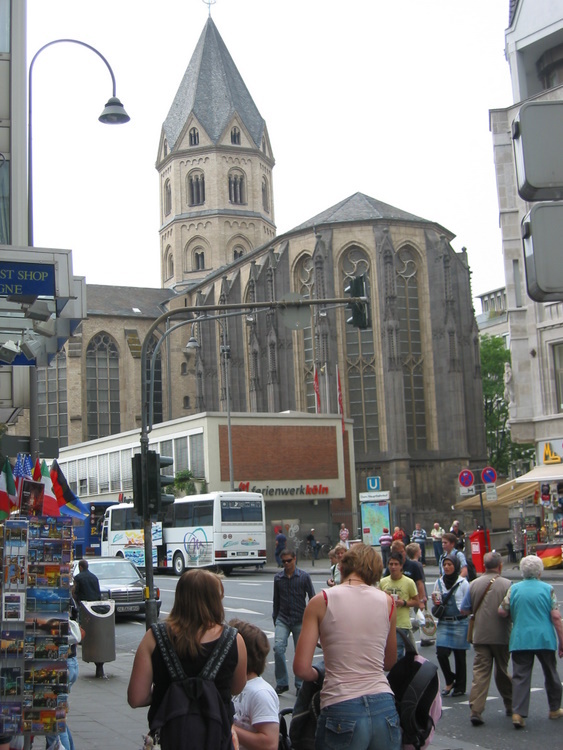 Cologne has twelve restored Romanesque churches. 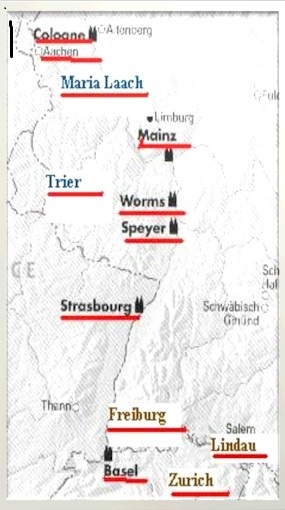 We had read about them before making the trip and located them on the map. Our intention was to visit each of them. We were able to find a wonderful book in a bookstore across the street from the cathedral that described each in detail. After lunch we found Gross St. Martin’s (no.9 on the map on top of this page), which was nearby but it was closed “for lunch”. We stopped at a gelato shop and had a good treat. We decided to walk to St. Andreas’ church (no.1 on the map at the top of page), another of the Romanesque churches. Archbishop Bruno , brother of the Emperor Otto I, founded this church in the 2nd half of the 10th century and dedicated it St. Andrew. The nave and the crossing tower was constructed in the 1200’s. The moldings on the capitals of the pillar were beautiful examples of late Romanesque sculptural art. 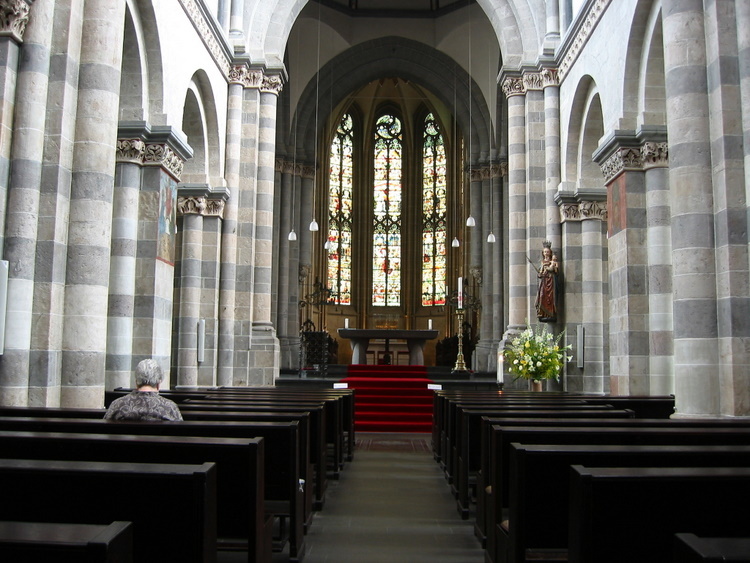 In the 13th and 14th centuries the side aisles were extended to form chapels. The columns with bands of alternating shades of gray were rather massive and supported the Romanesque round arch. Above the gallery arches was a “blind” triforium, that is, the arches were not open. Early in the 15th century th e choir was remodeled in the late Gothic style. By the end of the 16th century the northern transept was modified. When we left, it started to drizzle. We walked back to the hotel. We couldn’t decide whether to stay up and eat and go to bed at 6:00 since we had been up since our arrival at the wee hours of the morning (our time). We went back to our room and crashed for a while. We revived a little and decided just to eat down stairs in the hotel where there was a small restaurant. We were about the only people eating. My wife had an omelet and I had turkey. We got to bed about 7:00 pm, which was 2:00 in the afternoon our home time. So we had been up about 29 hours. We looked out the window once during the night and saw the cathedral all lit up. It was quite a sight.